Removal strategies are used in warehouse operations to select best products based on certain criteria. 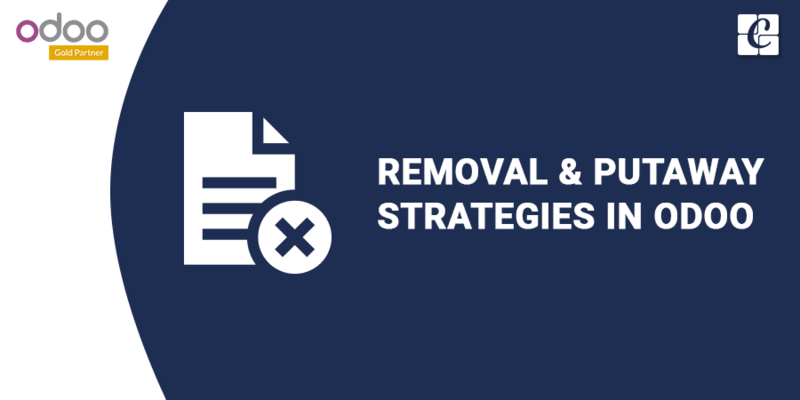 There are three types of removal strategies available in Odoo. FIFO, LIFO, and FEFO. These strategies allow us to manage our stock in an efficient way. From the inventory module settings, enable the lots or serial numbers option. Under the location & warehouse section, enable Multiple locations option, Advanced routing of products using rules and Expiration date on serial numbers option, then apply the changes. Now go to Inventory -> Configuration -> Warehouse Management -> Locations and select the location to which we want to apply the rules. Under the logistics section, we can select the removal strategy which we need to apply to this location. A First In First Out strategy can be used in situations where we need to remove the products which are stocked first in our warehouse. In this case, the products which entered last will move out first. It is used in case of products which do not have a shelf life. In FIFO strategy, products are dispatched from the warehouse based on their expiration date. In the case of FEFO strategy, we can set best before date, end of life date, alert date and removal date on the serial number. Go to Inventory -> Serial Numbers/Lots. The Best before date is the date on which the goods with this serial number start deteriorating, without being dangerous yet. End of Life Date is the date on which the goods with this serial number may become dangerous and must not be consumed. Removal Date: The date on which the goods with this serial Number should be removed from the stock. It is also possible for us to set these details from the product form itself. We can set the time in days. If we fill these details in the product form, the dates will be automatically filled when we create lots of the product. After setting the removal strategy, when we validate a delivery order, the products will be removed from our warehouse based on the method which we have configured. Putaway strategies are similar to removal strategies but affect the destination location. By using putaway strategies, we can move the products from the receiving location to a particular location. It will be done automatically. We need to enable multi locations and advanced routing from the inventory settings. Go to inventory -> Configuration -> Warehouse Management -> Locations for creating a putaway strategy. Click on ‘Create and Edit’ to create a new strategy and a new form will appear. When you have entered all the necessary information, click on Save. Now, when you purchase products with those categories, they will automatically be transferred to the correct location.